This article has interesting information on storing eggs. It’s often suggested to take the eggs from the sitting hen as they are laid and then replace them with artificial ones. The old advice is to store the eggs in seed and to turn them each day. Once all the eggs are produced, the artificial eggs are removed from the nest and the real ones returned. The idea is to have all the chicks hatch on the same day and so keep the last one or two from being runts. I did this with my first few pair of canaries. Once I had more birds than that I stopped, as it just became too much of a chore. Honestly, I really didn’t notice any difference in the number of healthy chicks. As far as I know, none of the canary breeders I’ve met take eggs from the nest to regulate the hatching. As for placing the eggs in seed, a moment’s thought reveals that not to be for the best. Seed absorbs moisture and that’s not good for the egg. Also, seed often has some dust and that too is a negative. The article below suggests using egg flats. These are made of cardboard. The article states that eggs stored under 7 days don’t need to be turned. Perhaps to maximize the production of rare canary varieties, egg storage might be a good idea? Here, more common hens can be used as fosters. This way, the more valuable birds will produce extra clutches. 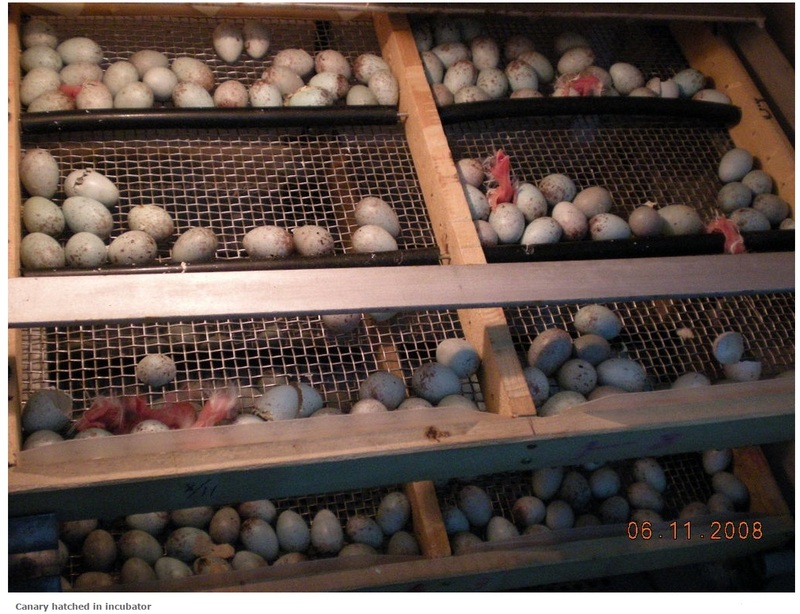 A bird farm in Formosa uses an incubator to hatch canary eggs. The chicks are put back into the nest to be raised by the adult.